Getting bored with your hairstyles ? Travel the road out of the woods into the new ages ! Getting Bored With Your Hairstyle? Are you getting bored with your same old same old hair style. It's starting to be a habit. Everyone always no what your hair is going to look like when you walk in the door. Well ladies you better keep that hair looking fabulous , but change it up sometimes. Make them notice When you walk in the door. Well here are a few tips to change up your hairstyle from just ordinary to extraordinary!! - How about trying a hair style that is the opposite of what you usually wear. Who knows, You might just like it !! NOOOO, you might just love it. I'm not talking about anything drastic, but maybe change from a up-do style to a wrap style. Or vice versa. If you want to completely change the look of your hair texture, try having a different type of hair sewed in. Hair weave ranges from straight, wavy, curly, & natural looking. With all the advancements in the hair industry, there is no way you shouldn't be able to find more than one style you like to wear. Surprise your man sometimes by walking into the door with a new do. He may just surprise you with a sparkle in his eye brighter than before. You may even get him to search the website with you for hairstyle ideas. - Take the time to Google different types of hair styles. 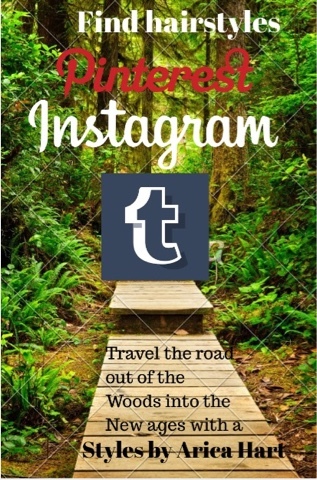 There are a variety of social media sites you can find various hairstyles on; such as, Instagram, tumblr and Pinterest . Sometimes I get loss in the time while viewing different styles and fashions. 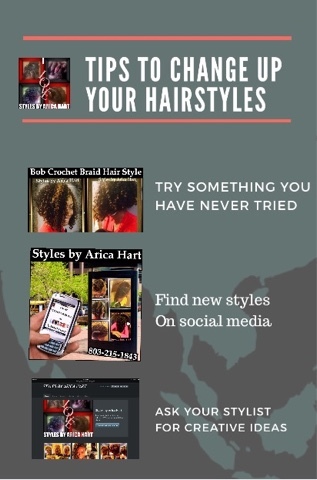 Hey you can even find hair " Styles by Arica Hart" on these sites. 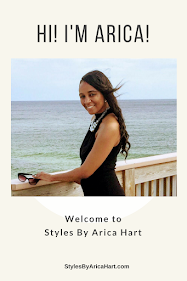 With a "Styles by Arica Hart"
- You may go to your stylist and see if they can give you any ideas. If you truly trust your stylist let her/him use their creativity on you for once. Just make sure to let them know the things you definitely don't like ahead of time, because they can't read minds. Just realize for certain styles you have to make certain adjustments. You may have to buy weave, cut your hair, or etc. depending on the look you are trying to achieve.